Lately, everywhere we look we’re seeing bold eyebrows. Whether they’re on Lily Collins on the red carpet or Cara Delevingne on the runway, it seems that when it comes to brows, the boldest and darkest are winning this season. While we’ve done enough shaping and pencilling to perfect the look on ourselves, the real issue comes when plucking your eyebrows. Waxing this area has taken a backseat as of late with the trend, and tweezing our brows for upkeep can get a little tricky. 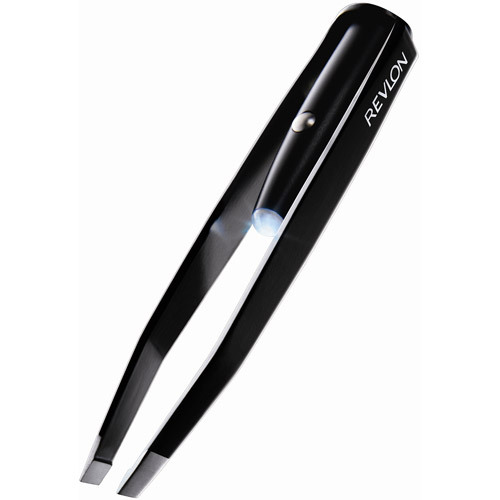 The Revlon Spotlight Tweezer with LED Technology, however, has made things much easier by shining a light on pesky hairs that need to be removed. Regardless of whether you’re tweezing brows or other hard-to-see facial hair, the Revlon Spotlight Tweezer will make the job quite a bit easier. The slanted, stainless steel tip ensures a quality hold on hair to pull it out at the root, and the spotlight allows you to see in dim lighting, or if you’ve got less than perfect eyesight. Remember to pull hair in the direction of its growth, and don’t over-tweeze your brows because this will irritate the skin. Simply turn on the spotlight and make tweezing less of a struggle than it needs to be.